I first met a prayer labyrinth when I was on tour with APU's Men's Chorale in 2011. 100+ guys were packed into a few busses as we drove up the West coast to Seattle, WA, singing our way to Pike's Place Market. At one of our stops in San Francisco, CA, we went to a church that had a massive labyrinth built into the floor. As someone who didn't yet understand what contemplative practices were, I watched as people went through the tile maze-looking thing on the floor. They walked in, paused in the center, and walked back out. A few years later, my ResLife staff went to a professional development day to a farm in Ontario, CA. On the tour of the farm, I noticed a prayer labyrinth that is now, sadly, gone. The guide asked us, "does anyone know the difference between a maze and a labyrinth"? I quickly responded, "Yes! A labyrinth has twists and turns, but no dead ends. It's one path that brings clarity, a maze brings frustration and confusion". I think our life with Jesus should be the same. In seminary, I took annual trips to the Serra Retreat Center in Malibu, CA. Over the course of those three years, I entered a prayer labyrinth, seeking clarity in the midst of frustration and confusion. I was seeking Shalom while balancing reading, assignments, youth pastoring, research assisting, getting married, etc. Christians have long used prayer labyrinths to seek answers to questions of faith, direction in life, petition for healing, creativity in their ministry, and to develop whole-hearted living. 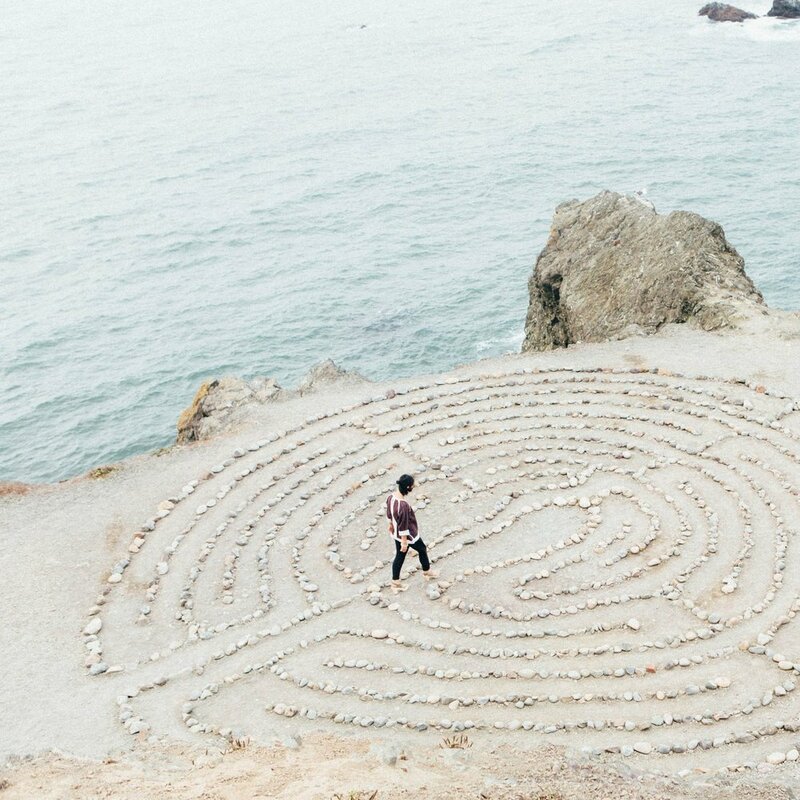 Prayer labyrinths teach us that in the midst of the twists and turns in life we can still make our way to God. One foot in front of the other, one step at a time. I have come to love contemplative practices, spiritual disciplines that ground us in our faith. If you’ve never used a prayer labyrinth or are interested in going to one see my guide to labyrinth below. 1. Before you enter. Center your focus on one question you have and want to talk about with God. Spend some time outside of the labyrinth and, if it helps, write out all the distracting thoughts you have. I've used labyrinths to discern career paths, academic programs, and even as I prepared to propose to Kristen. If you are thinking about switching majors, changing jobs, or feeling distant from God, the prayer labyrinth is an excellent place to start to gain clarity. 2. Entering the labyrinth. The labyrinth is not meant to be a fast walk. Think of it more like baby steps or trying to navigate your messy room in the dark. One foot in front of the other, one step at a time, making sure you stay on the path. Some people like to close their eyes as they walk through. The journey to the center of the labyrinth is a continuation of removing distractions. Take a few steps, focus your breathing, let your spirit commune with God, and begin to ask your question. 3. In the center. When you get to the center its okay to sit or kneel. Here you can picture yourself at your heart's center and in the center of God's presence. Ask your question, be still, be patient, and tune your heart to listen. 4. Leaving the Labyrinth. In my experience, I often leave faster than when I entered. I have a new, clear sense of direction yet still have the winding journey back to life. As I walk out, I go slow, using my imagination to explore how I will put what I received from God into practice. Be mindful of others. Labyrinths often only have space for one person on the path. If someone is coming toward you, it is ok to step over into the other lane, allow the other person to pass you, and step back in. Journal. I always bring my journal and spend some time writing down my reflections before and after the labyrinth. Give yourself time. I typically spend over an hour and a half in this practice. Don't feel like you need to rush. Have you used a prayer labyrinth before? Share your experience below in the comments section!